Snoozer’s left hand makes chord shapes along the entire length of the neck — perhaps a carryover from the banjoist’s use of inverted chord shapes? Snoozer liked to use hammer ons and pulloffs with his strong left hand to augment the melodic line. You can see a nice speedy little run of this trick around 2:35. The film was recorded by Charles Peterson, a guitarist/banjoist with Rudy Vallee’s Connecticut Yankees who turned into a jazz photographer. Charles’s son Don Peterson helped me definitively date the film to 1932 and says the location was Laurelton, NJ at their country home. Here is a photo from that same day. 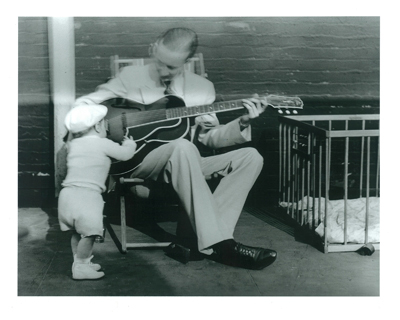 This is a picture of little toddler Don looking at Snoozer’s guitar. Snoozer Quinn and Don Peterson in 1932. Photo by Charles Peterson.